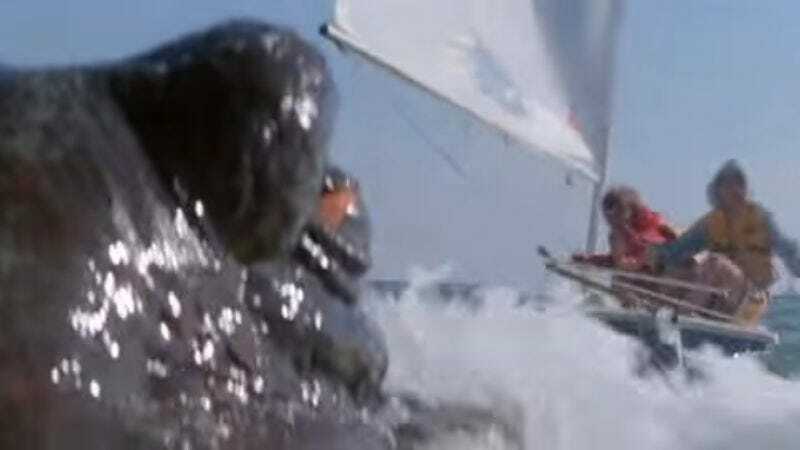 After the release of Steven Spielberg’s creature featuring, game-changing Jaws in 1975, a spat of ocean-centric horror movies were greenlit. With studios hoping to replicate said blockbuster’s high concept success, sharks became the stars of B-films in the late 1970s, with the likes of Mako: The Jaws Of Death (1976), Tintorera: Killer Shark (1977), and Up From The Depths (1979). These stories of killer sharks also paved the way for other forms of sea life to star on the big screen, with revenge-seeking killer whales (Orca, 1977) and flesh-eating fish (Piranha, 1978). But while these sharp-toothed beasts were the natural stuff of nightmares, one director, Ovidio G. Assonitis, opted to tackle a less overtly terrifying subject in Tentacles: the octopus. As in any horror film, the main issue is how and when to reveal the cause of all the terror. Assonitis (who went on to produce Piranha Part Two: The Spawning and launch James Cameron’s career) doesn’t manage this with much grace, and uses what looks like stock footage of writhing octopi during attacks. But this is the charm of Tentacles’ conceit: How did they think they were going to be able to make a massive killer octopus look real? It’s just as one doctor says after performing autopsies on the first victims: “I don’t know of anything that would operate with a vacuum effect of stripping a human being right down to the bone.” In that moment, Tentacles is playfully asking for a suspension of all disbelief. With such a ludicrous premise at hand, it’s hard not to comply. Availability: Tentacles is available on DVD, which you can rent from your local video store or Netflix. It’s also available in its entirety on YouTube.